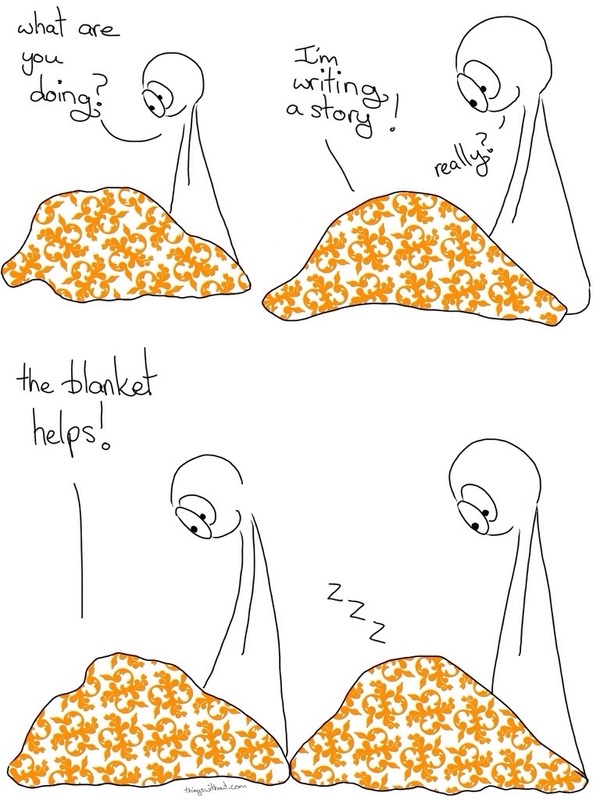 This might be my favorite way to create… And yes, I did get under a blankie to draw this comic… Zzzzz. But but but… how can a Thing write a story with no hands!! It’s really interesting looking at all the different ways we can write and the development of technology that gets us closer to writing using the power of our mind (eg http://cosmiclog.nbcnews.com/_news/2012/06/25/12401493-how-researchers-hacked-into-stephen-hawkings-brain?lite). I’d forgotten about that! There are definitely many amazing alternatives to hands. There are, however, several things I would no longer do without my hands (e.g. origami, or pottery), but I would still sing old Cat Stevens songs a capella. Pottery by mouth would certainly be an interesting challenge!